Memorial Day is the beginning of summer, the best season to spend time outdoors with friends and family. As you move outdoors for the season, you may notice what the fall and winter months have done to your outdoor living space, leaving built up dirt, grime, mold and mildew. Instead of looking at dirty surfaces all summer, a professional pressure washing company like Renew Crew can help you revitalize the surfaces. Deck and Patios. When you think outdoor surfaces, your first thoughts may go straight to decks and patios. It’s where you spend your times outdoors and because it is a horizontal space, yard debris can build up in the fall and winter months leaving dirt behind. Fences. Fences are the walls to your outdoor living space. It’s common for mold and mildew to settle on fences and other surfaces. Additionally, mud will cake on the bottom of the deck posts and boards, especially after it rains. Siding. Have you ever noticed that your home’s color looks a little dingy? If you haven’t had siding cleaning in a long time, your siding may be dirty. 1.) We apply an environmentally friendly cleaning solution to the surface. Whether it’s for decks, patios, siding, gutters or other surface, our effective cleaning products work their way into the surface, loosening dirt and grime. 2.) Once the product has had time to work its magic, we rinse the surface with a low pressure wash to revitalize the surface. 3.) The last step is our most important step: protection. Without protecting the surface, pressure washing companies leave the surface open for more dirt. At Renew Crew, we block the surface with a protectant that blocks moisture, dirt and grime. If you want your backyard updated before the height of summer, please contact your local Renew Crew office. At Renew Crew, the majority of our clients contact us because their outdoor living spaces aren’t looking great. Their decks or fences may be greying or their patio or gutters may be stained. A space does not have look bad to warrant a visit from Renew Crew however. Take this gazebo for instance. It doesn’t look bad at all. The color is even and it isn’t fading or chipping in any area. The owners simply didn’t like the color. It was too dark for their taste and they wanted something lighter. Even though the wood wasn’t dirty, Renew Crew’s still needed to clean, strip and protect the surface. A stripping formula had to be used to remove the existing color as a lighter stain can’t be applied to a darker to make a difference. After the color was removed, Renew Crew used its eco-friendly wood cleaning solution to remove any dirt or grime that had built up on the surface. A lot of the dirt would have been removed in the stripping process, but you can never be too careful! Once the cleaning solution was able to loosen any dirt, grime or dead wood fibers, we rinsed it with a low-pressure wash. This is where hiring a professional pressure washing company is helpful. Pressure washing can easily cause damage on outdoor surfaces, sometimes leaving gouges or chips if it’s a patio, not to mention you can easily hurt yourself! Each of our trained team members knows how to get rid of all the grime safely without damaging your outdoor living spaces. The last step is protecting the wood, which is also when the wood gets its color. Renew Crew applied a lighter, semi-transparent wood protectant to the gazebo. It was the perfect update for the homeowner to have the brighter outdoor living space she was hoping for. If you have questions on cleaning or updating your outdoor living spaces, please reach out to your local Renew Crew office. Gutter cleaning is an important part of outdoor maintenance, however, most homeowners focused solely on the inside of the gutters. But cleaning the outside of your gutters makes your home look brighter and well kept. I have to admit, when I first purchased our home, I never even looked at the outside of my gutters. As a new homeowner, I knew I needed to periodically clean out any leaves or other debris that may clog my gutters, but when it came to the outside of the gutters, they were completely ignored. It wasn’t until I really paid attention that I realized how dirty they were! When you think about it, it’s not surprising that the outside of gutters get so dirty. Tar and debris from your roof shingles will streak down and stain the outside, dirty water may roll over the surface and they are constantly vulnerable to Mother Nature’s elements. Cleaning your gutters is one home maintenance task that we recommend a professional pressure washing company tackle for you as there are some safety concerns. Gutters are high off the ground and you’ll need the right equipment to reach the area (you don’t want to clean on an unsteady ladder). Additionally, gutters can easily be cut or dented if a pressure washer isn’t used properly. At Renew Crew, our trained gutter cleaning and protecting technicians will make your gutters look great, and keep them looking that way! First we apply a deep penetrating cleaning foam to the entire gutter. We use environmentally friendly foam because it sticks to the surface longer than a liquid, allowing it to loosen dirt and stains. After the foam does its job, we rinse it all away with a pressure washer. After this step, you’ll be able to notice the difference clean gutters can make! Lastly, we apply a clear protectant to the gutters. The protectant will keep dirt and stains from setting into the surface again. If you have questions regarding professional gutter cleaning, or any other outdoor surface, please call your local Renew Crew experts. It’s just about that time of year, when you escape to the water, mountains or other getaway for the weekend. I remember vacationing with my family at a lake in Maine in a cozy log cabin for a week each summer. Since then, I’ve always loved the look of log cabins, but never knew the necessary work it required. Log cabins, like any home require regular maintenance. With harsh outdoor elements and normal wear, a home needs to be clean and sealed, however it may be even more important for wood cabins. As wood is exposed to the suns’ rays, it will begin to loose its beautiful color and dry out. At Renew Crew, we can revitalize your log cabin with our wood cleaning and protecting. Take this project from Renew Crew of Lake Gaston for example. As you can see, the log cabin needed an update. The wood has started to grey in areas leaving the color inconsistent throughout the surface. Renew Crew came out to preform its three-step wood process. The first step in log cabin cleaning is to foam the entire service with a wood cleaning product. Unlike other pressure washing companies, Renew Crew uses a foam product so that it can really work its way into the service. Liquid cleaning detergents tend to run down vertical spaces before it can loosen dirt and dead wood fibers. After allowing the wood cleaner to work, the surface is rinsed with a low-pressure washer. The water pressure will rid the surface of the dirt, grime and fibers. It’s in this step when you will notice the difference professional surface cleaning can do. The last step is arguably the most important: protection. After the log cabin has dried completely, Renew Crew applies a protective layer that will stop water and dirt from getting back into the wood’s pores. Additionally, it will reflect the UV-rays from the sun so it won’t dry out as quickly. While the protection factor is important, the application will also bring back the color of the wood. Renew Crew has a number of different color protectants for our clients to choose from. If you want to look at a beautifully clean log cabin this summer, please reach out to your local Renew Crew office. It isn’t uncommon for one’s house to look its best right before putting it on the market. All of the aesthetic updates that you had been procrastinating on all of sudden are at the top of your list. With the housing market on the rise, now is the perfect time to get your home in tip-top shape and on the market. First impressions are not only important in life, but also in real estate. A potential homebuyer has to be able to picture themselves living there. I remember when my husband and I were first looking for a home four years ago, the house had to give me a good impression outside to really sell me on the inside. The exterior of your house and the surrounding property is the first impression, so it has to look great! Here are some ideas on things to do to your property to make it ready to sell. Clean the roof. It’s normal for a roof to show dirt over time, but you want it to look nice and clean when the house goes on the market. Roof cleaning makes a big difference when it comes to the appearance of your home. Repaint your front door. If you have an older home with an older front door, make sure it looks great for potential buyers as it’s the first thing they will often see up close. A new coat of paint could make all the difference. Trim your bushes. You don’t want any buyers to come to your house and think “this is going to be a lot of work.” Cut down your grass and bushes to make it look like an easy to maintain property. Make sure nothing is blocking the windows, stopping the light from coming in. Clean your windows. No one likes to clean windows (unless that person is crazy), but it’s important to do so before buyers come to your home. For those hard to reach windows, there is outdoor window cleaner that you attach to your hose and you just spray it on. Mulch. Mulch goes a long way. It can make everything look cleaner and more organized when properly done. Mulch underneath bushes and in flower beds to make the yard look cared for. Clean your Decks and Patios. 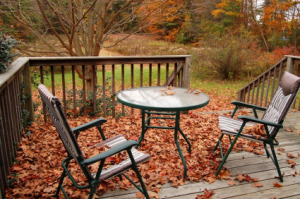 A dirty deck or patio doesn’t give the best first impression to a potential buyer. Look at your outdoor surfaces and evaluate whether or not they need to be professionally cleaned and sealed. At Renew Crew, we transform greying, weathered decks that look like they are past their prime back into beautiful spaces that anyone would be happy to enjoy. Some of your structures may be difficult to clean on your own, so consider hiring a professional pressure washing company. If you have questions regarding outdoor surface cleaning, please reach out to local Renew Crew office. A good friend of mine has a lake house where in the summer many weekends are spent relaxing and enjoying the beautiful weather on the lake. A few weeks before the real season begins, we make the trip to the house to clean it up for the season. Inside, we stock up on the essentials, dust and straighten up. Outside there is much more work. It entails pulling out furniture from storage, clearing any debris that may have fallen and general upkeep. Over the years some areas of the property have shown its age, including their dock. While it’s not necessarily time for it to be replaced, it needs to be cleaned. Power cleaning a dock is a necessary maintenance chore, but it’s also one that needs to be done properly. The products that you use on a deck may not be good for cleaning a dock. Many wood cleaners include harsh chemicals that can harm the water, and the living organisms, under the water. Renew Crew’s environmentally friendly dock cleaner is safe to use over both fresh and salt water. It won’t harm any of the plants or fish. Just like we do with a deck, we use a thick foam to dig deep into the wood surface, loosening up any built up dirt, mold and grime. 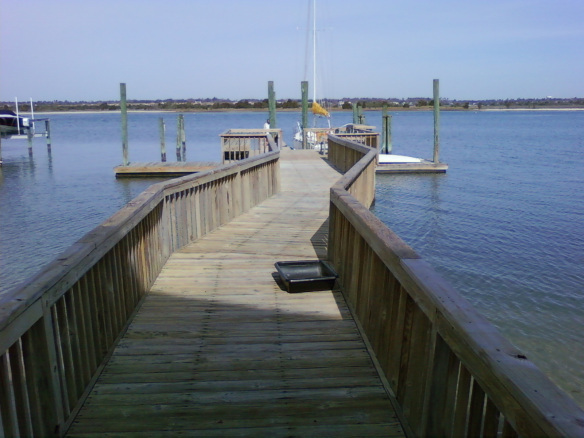 A low pressure wash will get rid of that dirt, leaving your dock looking new for the summer. 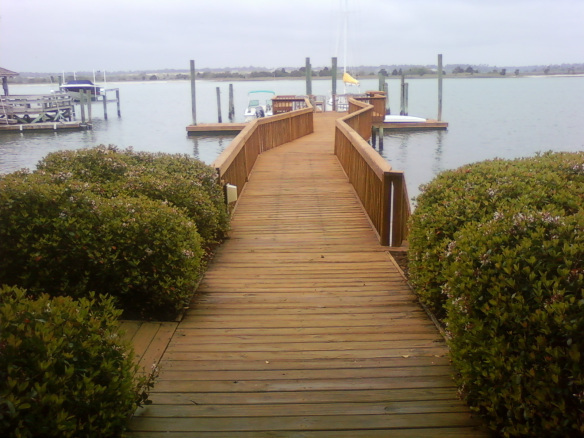 Check out the before and after on this dock! Professional power cleaning will make your dock look just like new. If you have questions on the process, please contact your local Renew Crew location. At Renew Crew, we are committed to providing our clients with clean exterior services that look like new, but there is more to creating the best outdoor areas that a home can have. To ensure homeowners are properly maintaining their properties, here are our 5Ps. Plan. From cleaning to landscaping, outdoor maintenance can be both an investment of time and money. Homeowners need to plan for the financial implications of updates, as well as what time they may need to schedule so everything is done effectively. Perform tasks on a regular basis to reduce seasonal wear and tear on your home’s exterior surfaces. Large projects are needed less frequently when issues or messes are dealt with on a regular basis as opposed to left alone to get worse. Peruse the exterior of your home and outdoor living spaces. Most homeowners don’t walk around their property on a regular basis looking for things that may need to be fixed or updated, but you should. Taking the time to look at your home from various angles to determine any issues and repairs that need to be addressed is a key component of properly maintaining your home. Protect your home and the environment by choosing maintenance and repair materials that are sustainable. Household products don’t have to be harsh on your outdoor living spaces or the landscaping around it. Professional. You can’t be expected to know how to fix everything on your property. Whether its a roofer or a professional pressure washing company, it’s important to know when something is out of your skills set and it’s time to call a professional. The home, for many owners, is the most expensive asset they have, so it is important to take care of it. It’s recommended to spend 1-2% of the property’s value in maintenance each year. If you need your exterior surfaces cleaned and protected, give Renew Crew a call! We would be happy to help you!